A horseplayer since the age of nine, Wendy Long brought 45 years of handicapping experience with her to the contest world when she joined the NHC Tour in 2012. She’s qualified for the NHC four years running and already holds one berth to the next renewal of the world’s richest and most prestigious handicapping contest – the Daily Racing Form/NTRA National Handicapping Championship presented by Racetrack Television Network and Treasure Island Las Vegas, set for Jan. 27-29, 2017, at Treasure Island – thanks to a March 5 win on NHCQualify.com. Coupled with an earlier strong finish, also on NHCQualify, Long’s point total of 6,139 leaves her 38th on the overall leaderboard heading into this weekend. A veteran sportswriter – this summer she’ll be inducted into the British Columbia Sports Hall of Fame – Long is used to being the one asking questions. 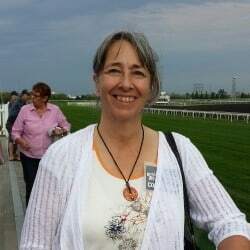 Over 22 years at the Vancouver Sun she covered every event imaginable, including seven Olympic Games and even a few Breeders’ Cups. But now, as a regular on the NHC Tour, she’s part of the story and has to answer our questions! How did you get off to such a good start this year? [NHC 17 in] Las Vegas. I always take a month off to recharge the batteries. And then one of the first tournament I played in after coming back I won. That’s the earliest I’ve ever qualified. How did you win the March contest? Do you remember any key plays you made? “I was clicking along pretty well and was in fourth or fifth going into the second-to-last race. Then this longshot came in that a whole bunch of people seemed to have except for me. I dropped to 13th place and this has happened to me several times, where I do well early but I end up being the cheap speed and I fade. How do you like to handicap and what tools do you use? “I’m old school. I have a cup of coffee in one hand and the Racing Form in the other and those are my basic tools! I like to have the actual newspaper so I can make little notes on the pages. I know a lot of people these days will study online but I’m a tactile person and I need the paper in my hands. How were you first introduced to horse racing? “I was born a horse-crazy little girl. I grew up reading Walter Farley’s Black Stallion books. I remember as a kid, on Saturdays, they used to show the feature race from our local track, Exhibition Park, and I used to watch that. They’d also include the feature from Santa Anita. There was a horse called George Royal who raced up here then and Johnny Longden rode him to win the San Juan Capistrano [in 1966] and that was Longden’s last race. That’s one that’s just cemented in my mind as a great horse racing moment. How did you meet your husband and fellow contest regular Steve Nemetz?